The Clinical Practice Unit manages student placements for clinical by requesting and securing placements in over 100 health facilities and placing students in over 5500 individual clinical settings each year. The Academic Programs Office provides support and assistance to the UTS Student Centres on UTS: Health processes and issues and manages and supports Health's courses and specific student issues and processes. Students must contact the UTS Student Centre in the first instance and complex issues may be referred by staff in the UTS Student Centre to the Academic Programs Office. The director provides academic advice to nursing students on their program and other assistance such as helping students who experience difficulties coping with their academic work. The director provides academic advice to midwifery students on their program and other assistance such as helping students who experience difficulties coping with their academic work. The director provides academic advice to sport and exercise students on their program and other assistance such as helping students who experience difficulties coping with their academic work. The director of clinical practice manages policy and procedures related to clinical practice. The academic liaison officer provides advice on alternative assessment to students with short or long-term disabilities, have carer responsibilities, who are pregnant or have English language difficulties. The associate dean is responsible for the overseeing and quality of academic activities and the coursework programs. Students are allocated to particular groups or classes within a subject. This class determines when they attend laboratory sessions as well as tutorial times. Students must state their preferences for classes at enrolment. Students are allocated to classes and may then make changes to their allocation (subject to available places). Further information on this process is available from My Subject Activities. Some class changes may be limited by nursing practice restrictions in some years of the undergraduate courses, or by cohort management. The Bachelor of Nursing, Bachelor of Nursing Bachelor of Arts in International Studies, Bachelor of Midwifery and Bachelor of Midwifery Bachelor of Creative Intelligence and Innovation are accredited by the Nursing and Midwifery Board of Australia. Graduates are eligible to apply for registration as a Registered Nurse or Midwife. In addition, for registration eligibility, the Nursing and Midwifery Board of Australia requires applicants to provide evidence of identity and good character, and documented evidence for assessment of any variation to the standard education program, for example recognition of prior learning. As part of their studies, students are required to undertake clinical practice in a variety of health facilities. This involves students being placed in a clinical environment in accordance with the nursing clinical ladder. Students are provided with a clinical facilitator who supports their clinical learning and undertakes their assessment. UTS: Health makes every effort to place students in a health facility in close proximity to their home or close to public transport. However, this is often very difficult to achieve given the limited number of student placements. Students should expect to travel across the greater Sydney region during their program to meet their clinical requirements. Reasonable adjustments can be made for students with special needs and/or carer commitments. Carer commitment – where a student is the primary carer of an immediate family member/s; such requests must be supported by the faculty's academic liaison officer (ALO). Special needs – where, for example, a student has a disability and/or an existing or ongoing illness; such requests must be supported by UTS: Accessibility Service. As part of their studies, students are required to undertake clinical practice. This involves students being placed in a midwifery practice environment in accordance with the midwifery practice ladder. Students are supported by a midwifery practice facilitator or midwifery educator. UTS: Health makes every effort to place students in a health facility in close proximity to their home and close to public transport. However, this is often very difficult to achieve given the limited number of student placements, and students are asked to take this into consideration when they receive notification of their placement. Students in the Bachelor of Nursing, the Bachelor of Nursing Bachelor of Arts in International Studies, Bachelor of Midwifery or the Bachelor of Midwifery Bachelor of Creative Intelligence and Innovation must undertake nursing and/or midwifery practice placements as a prerequisite to satisfactory course completion. Information regarding the practice placement procedures for students with disabilities is available from Accessibility in the University-wide general information. Students commencing this course must consider the inherent requirements to be able to achieve a passing grade in their clinical practice assessments. Students with concerns should contact UTS: Accessibility Services. Any student or staff member involved in an accident, injury or incident while on clinical placement must complete a standard accident/incident form. Both the student and their supervising facilitator or educator are required to complete the form, in addition to any other form/s required by the facility. If an injury sustained by a student raises doubts about the student's ability to attend subsequent nursing or midwifery practice experiences, the matter should be referred to the Director of Clinical Practice. The Nursing and Midwifery Board of Australia requires students to undertake a specified number of nursing or midwifery practice hours. One hundred per cent attendance on practice is required. Students who experience unforseen illness or misadventure, as per UTS rule 8.3, are required to complete a special consideration form. Students in this category may then be offered completion of nursing or midwifery practice at the next available relevant placement. Should a student fail to complete all nursing practice hours for any other reason, including work or social commitments, they will not be offered the opportunity to complete their nursing practice hours, and run the risk of failing the subject. Students are required to attend designated shifts while on nursing practice. Shift times vary between facilities; however, common start times are 7am and 1.30pm. When assessing whether students are eligible to undertake additional hours to complete their nursing or midwifery practice, the Faculty of Health examines a student's nursing or midwifery practice history, taking into account past attendance as well as the requirements of the Nursing and Midwifery Board of Australia. Therefore, it is in the interests of students to ensure that they maintain a complete attendance record. As indicated above, students may not be given the opportunity to complete missed nursing practice hours and consequently may fail the subject. Students undertaking supervised nursing or midwifery practice must follow the directions given to them by their facilitator, midwifery educator or academic liaison officer or, in the absence of these, the staff of the hospital or agency concerned. Students are reminded that they are required to adhere to clinical placement facility policy and procedures. While on clinical practice students are being assessed on their professional conduct and failure to adhere to facility policy and procedures including professional conduct may result in an unsatisfactory assessment. exercising a duty of care toward others in everything undertaken. All students must be aware of risk management policies and processes and be capable of implementing these within the clinical environments. Students must also comply with the policies and procedures of the relevant health facility. Pregnancy does not preclude students from clinical practice however some clinical placements may be potentially harmful to the developing foetus and to the student. Pregnant students are expected to notify the Faculty of Health of their pregnancy if they are working or studying in areas where there may be particular health and safety issues, e.g. radiation, working with infectious disease, cytotoxic drugs or anaesthetic gases. Students who are pregnant and in their third trimester of pregnancy, or within the first six months of being postnatal, must have the written permission of the Director of Clinical Practice to attend clinical placements. Students must also comply with health care facilities' guidelines and recommendations when undertaking placements. Where a student is pregnant it is recommended that they meet with the Director of Clinical Practice prior to census date to decide on the most appropriate course of action to ensure safety and progression concerns are addressed and planned for. All students involved in clinical placements must be fit to do so. Students who have health problems or who are under the influence of alcohol and/or other drugs that might foreseeably render them unsafe during nursing or midwifery practice placement, or who have a health problem that may be affected adversely during their placements, should seek medical advice before undertaking a placement and should advise the Director of Clinical Practice. Failure to do so may result in the Faculty of Health accepting no responsibility for the consequences. Each student is responsible for evaluating the foreseeable health risks before and during each clinical placement, and implementing risk management strategies in consultation with the subject coordinator, and UTS environmental, health and safety guidelines. Students must also adhere to policies and direction from workplaces where the clinical placement is held. Students are required to wear the official uniform of the Faculty of Health during all nursing and midwifery practice placements. Academic staff will indicate any other occasions when students must wear their uniform. Some nursing practice placements, e.g. mental health, may not require the official uniform. Students are notified of this when they receive their practice placements. Students must purchase their uniform from the approved suppliers. black, closed in rubber-soled shoes. Other requirements are as follows. Fingernails must be short and clean. Only clear nail varnish is acceptable. Artificial nails must not be worn by healthcare professionals providing patient care. Hair must be worn off collars. Students with long hair must wear it up; long ponytails are not acceptable. Students are permitted to wear a wedding ring and one pair of small, plain studs in the ear lobes. No other jewellery or piercings are acceptable. Watches should either be digital or have a second hand, and must have no sharp edges, fancy watchbands or large buckles. A multicoloured ballpoint pen and small notepad are essential requirements. A small pocket calculator is advisable. Academic staff will provide advice to students on other items which need to be purchased, e.g. fob watch, stethoscope, scissors. Students must wear the uniform from their first nursing or midwifery practice placement in Autumn session and should ensure that their uniform is available by this time. All students must wear their UTS photo identification card, with retractable cord, at all times near their collar; this is available from the Co-op Bookshop for a nominal fee. All nursing and midwifery students who are required to attend clinical practice as part of their program are required to meet the NSW Ministry of Health (NSW MoH) Verification requirements. These include, but are not limited to, complying with criminal clearances and the screening and vaccination against infectious diseases – evidence for the screening and vaccination against infectious diseases is recorded on a NSW Health Vaccination Record Card for Health Care Workers/Students which is available for collection at the CPU, UTS: Health Student Centres or UTS: Health Student Services. Meeting these requirements may result in costs to the student. Complying with these policies is now managed through the NSW MoH ClinConnect system and all students must be verified through this system to be attached to a placement. Students are recommended to commence collecting the information required when they are accepted into a Nursing or Midwifery course as students who are not verified are not able to be allocated placements. UTS is committed to the health, welfare and safety of its students and staff. The following guidelines have been set up in order to ensure legislative requirements are adhered to, along with minimising infectious disease transmission to and/or from our students and staff. National Health and Medical Research Council (2003), The Australian Immunisation Handbook, 8th edn, Commonwealth of Australia, Canberra. NSW Health (2005a), Occupational Assessment, Screening and Vaccination Against Specified Infectious Diseases, Circ 2007/006, 1 February 2007. NSW Health (2005b), Tuberculosis Screening and Protection – Health Care Worker, Circ 2001/71, 1 August 2001. Acceptable immunisation status is a prerequisite for attending clinical placements, due to legislative and organisational requirements. Health facilities have the right to preclude students who are not immunised in accordance with their policies. There are academic progress implications for students who fail to complete practice requirements for this reason. Students who are unable to complete vaccination requirements for any reason (including conscientious objection) must request authorisation through the Director of Clinical Practice at least four weeks prior to every clinical placement. In most cases authorisation will be denied due to external organisation policies and requirements. Students who are unable to meet immunisation requirements will significantly impact their ability to complete their course. A student's performance is deemed unsafe if it places patients, clients, their families, staff members or fellow students at risk, and if he or she is unable or unwilling to perceive that risk. The judgment that a student's performance is unsafe is usually made on the basis of more than one incident, however, it can be made on the basis of one episode. Students whose performance is deemed unsafe are removed from the health facility as soon as the judgment is made and are referred to the Director of Clinical Practice, who determines the appropriate course of action. Students may receive a fail grade for the subject, or be given an opportunity to demonstrate improvement in an alternative clinical environment such as the laboratory. If satisfactory, students are given another opportunity to complete their nursing or midwifery practice in a clinical environment. A student's performance is deemed unsatisfactory if it fails to meet the objectives and assessment of a given nursing practice experience. Each student has a formative assessment part-way through his or her clinical placement. If unsatisfactory performance is identified in this assessment, the clinical facilitator/midwifery educator/academic liaison officer notifies the student and identifies a plan of action. This includes major areas of improvement and specific aims to be met to achieve satisfactory performance. If the student and/or the clinical facilitator/midwifery educator/academic liaison officer have reason to believe that they cannot work together to implement the improvement plan, a request can be made by either person to the subject coordinator for alternative arrangements. Each student receives a summative assessment towards the end of her or his clinical placement, which is assessed as either overall satisfactory or unsatisfactory. 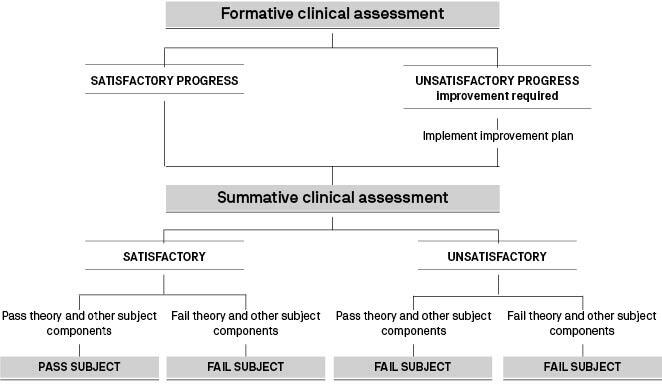 The following diagram demonstrates the process for clinical subject assessment. hospital policy allows students to administer intravenous medications under the direct supervision of a registered nurse as set out above.